A garden without a viburnum is akin to life without music and art. Michael Dirr, renowned horticulturist, author, and woody plant expert, is above quoted from his book that four decades of plant students, enthusiasts, and experts alike have been referencing, Manual of Woody Landscape Plants. 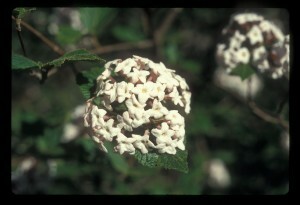 Viburnum is a large genus, with at least 150 species (some taxonomists believe many more) found worldwide. Most often having a shrub habit, there also are tree-size species. Commonly considered a deciduous shrub, there also are several species that are evergreen. Most species produce reliable multiple-season interest in our landscapes. Spring flowers range in colors of white, off-white, and even a few with a pinkish hue. Autumn foliage displays can be beautifully reliable on many species. Additionally the fruits developed in late season may be the most flamboyant ornamental attribute. Here in Mount Auburn, our Horticulture Department’s most recent plant inventory tallied eighteen different species, and five hybrids, growing within our landscape, totaling over 200 plants. Turning again to Dirr, in his 2007 book, Viburnums, Flowering Shrubs for Every Season he enunciates, “…They comport themselves with understated dignity, the sum of all their seasons greater than their parts.” We discuss herein several species that will be found flowering in May. Koreanspice viburnum, Viburnum carlesii is immensely popular, even to those not knowing what it is, because of the intoxicating, spicy, clove-like, fragrance of its ½-inch-small, flowers. Pink to red in bud, these flowers, opening white, are aggregated in a dense, globose cluster, or cyme. With a gentle breeze, the fragrance may be detected a considerable distance before one comes upon the shrub. The opposite, simple, one-to-four-inch, broad-ovate leaves have a minutely serrated margin. In the autumn these leaves may provide a vibrant red fall display. Noted plant explorer and author, Ernest Henry Wilson (1876-1930), adds his praise, “…For the small garden where there is only room for the choicest shrubs the one Viburnum, above all others, that should be grown is V. carlesii. This is a real aristocrat…” This was named to honor William Richard Carles (1849-1929), who served as British Vice-Counsel to Korea from 1883 to 1885. He made several exploratory trips into remote areas, and in 1885 was the first to send dried specimens of this plant back to Kew Gardens. With two-dozen Koreanspice viburnum growing here, look for some at Lawn Avenue, Halcyon Avenue and Asphodel Path, among other locations. Doublefile viburnum, Viburnum plicatum var. tomentosum in flower is exceedingly elegant. 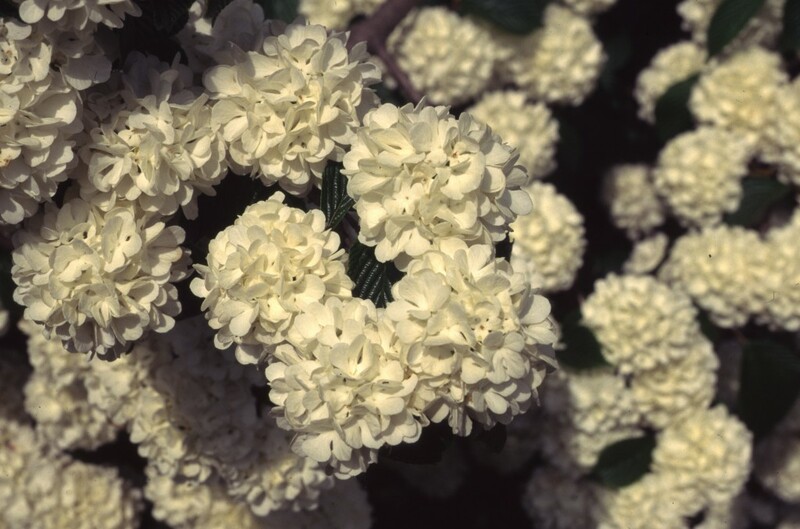 Aptly named, its abundant creamy white flowers cover the upper sides of branches, in double rows, held up on two-inch-high stems (peduncles). These flowers are each composed of both fertile and sterile flowers. The white, showy, outer flowers are each one-inch broad, but are sterile. It is the much smaller fertile flowers located nearer the center, that if fertilized will later produce fruits. The egg-shaped, 1/3-inch-long, drupes will change from early bright-red color to black at maturity. There are dozens of species of birds which often will devour these fruits even before they have fully ripened. The opposite, simple, two-four-inch-long leaves have a strongly serrated outer margin, and its leaf veins are distinctly impressed. These leaves tend to hang down which provides both the flowers and fruits more visibility. Autumn color is an attractive reddish-purple. Look for an outstanding specimen located between Poplar Avenue and Holly Path. Japanese snowball viburnum, Viburnum plicatum ‘Grandiflorum’ is a cultivated form which possesses all sterile flowers. Two-to-four-inch, globose shaped flower heads open with a greenish color, but soon mature to white. Many visitors upon seeing this in flower agree that it has an appropriate common name. Look for a fine specimen on Chestnut Avenue. Siebold viburnum, Viburnum sieboldii is one of the larger viburnums, easily reaching heights of 15-20’, or taller. Its habit may be either a tall shrub, or a single trunk, small tree. 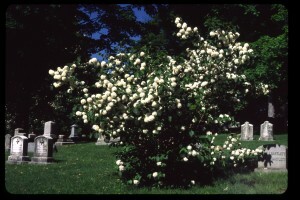 Usually in late May, the tiny, creamy-white flowers will be borne in three-to six-inch, flat-topped clusters. The fruits that follow the flowers go through color changes, green to an attractive pink and red, finally becoming dark blue-black when mature. As with many viburnums, the fruits seldom persist, as they are relished by birds. This Japanese plant is named to honor Phiipp von Siebold (1796-1866), physician-botanist, who achieved notoriety while living in Japan, by performing the first cataract operations in that country in 1822. 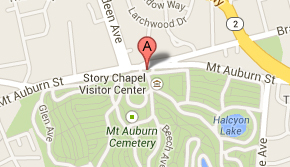 Look for Siebold viburnum at Azalea Path, Elm Avenue and Euonymus Path, among other locations. With-rod viburnum, Viburnum cassinoides is a North American native, growing from Newfoundland to Manitoba, south to the mountains of Georgia. 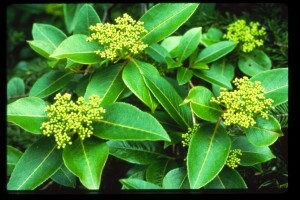 This is often a slender, erect, 6-12’-tall shrub, with two-to-four-inch long, glossy, thick, leathery, but deciduous leaves. Autumn foliage can be an outstanding deep red to scarlet. The tiny 1/4-inch, white flowers are arranged in two-to-four-inch, dome-shaped clusters. 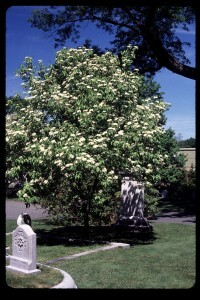 When fertilized, the flowers will produce a ½-inch fruit later in August that is yellow/white at first, turning pink, then eventually bluish-black. Look for With-rod viburnum in Consecration Dell. Nannyberry, or Sheepberry, Viburnum lentago is another viburnum native to North America, Hudson Bay to Manitoba, south to Georgia and Mississippi. This is usually a tall, 15-20’ shrub, although Dirr in Viburnums, states that the national champion, in Oakland County, Michigan, is 50’ tall! 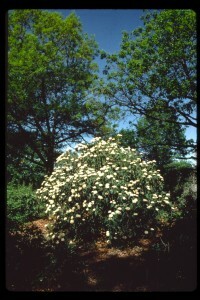 The tiny creamy-white flowers are abundantly borne in showy clusters (cymes), about four-inches across. Its common name allegedly is because the odor of its bruised twigs and fruits smell like sheep. Others suggest that the wood smells like a wet goat. The fruits change color from green, to yellow, to red, finally to bluish-black. Look for Nannyberry on Elm Avenue and in Consecration Dell. 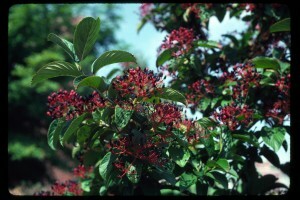 Leatherleaf viburnum, Viburnum rhytidophyllum is a 10-15’ tall, evergreen viburnum. More than just evergreen, these four-to-eight-inch-long leaves are boldly textured and wrinkled, adding true, multiple-season interest. As yet another May bloomer, its yellowish-white, tiny flowers are borne in four-to-eight-inch, flat-topped cymes. The fruits color red, then black, although sometimes displaying both colors at the same time. This is native to western and central China, and was introduced in 1900, by the famous plant explorer and author, Ernest Henry Wilson. A fine specimen is found at the intersection of Beech Avenue and Linden Path. In addition to the dozens of species of birds and various mammal wildlife, that feed on the fruits of all the above, these viburnums provide pollen, and to a lesser extent nectar, for a variety of visiting insects; bees, wasps, flies, beetles, butterflies and moths. So collectively, all of these viburnums, and many others not discussed here (flowering later and earlier), significantly improve habitat for wildlife within Mount Auburn, as well as enhancing the ornamental horticultural experience during your May, and later visits. I’d never heard of cymes, but now I’ll go look at mine. A lot of variety in viburnums’ flower arrangement! Do you have any problems yet with the Viburnum beetle? I am in SW NH and it came to us two years ago. So far it has done what I’ve read and preferred natives (most annoying). I grow probably ten species and it hit V. dentatum badly but so far not V.dilatatum. It also seems not to be too bad on the early bloomers, eg not V. juddii at least so far. However, I’m not planting more Viburnums which is a great loss for me. Yes, Mount Auburn has had to deal with bad results of the viburnum leaf beetles, particularly with our Arrowwood, V. dentatum. In writing about viburnum, I intentionally included those species that have proven to be most resistant to these beetles, Koreanspicebush viburnum, V. carlesii, Doublefile viburnum, V. plicatum var. 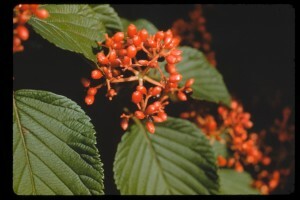 tomentosum, Siebold viburnum, V. sieboldii, leatherleaf viburnum, V. rhytidophyllum, as well as two tested as only moderately susceptible, nannyberry viburnum, V. lentago, and withered viburnum, V. cassinoides. One source of information I referenced was Cornell University at http://www.hort.cornell.edu/VLB. Thanks so much for your response. The “bug” situation is always interesting. I came 13 years ago to NH from NJ and still marvel at the gorgeous adelgid free hemlocks all over my 50 acres and I expect their arrival will be after I’m gone, at least I hope so. The stupid Viburnum beetle coming down from the North has been interesting. So far, I agree, V. dentatum has been hit hard (basically gone). V. juddii has also gone from me, despite its carlesii genes. Nudum and Onondega are still okay. And of course V. Plicatum thrives. Not sure rhytidophyllum is hardy for me but I’ll give it a try. Do you spray or treat? I don’t partly because I hate chemicals and partly because my research says it doesn’t work. Oh, well, there are lots of alternatives. Do you grow Neillia sinensis? It has done very well for me here (large) over many years. For at least the past two decades, we generally have eliminated chemical applications throughout our landscape. By this and other proactive planning/actions, we strive to improve and enhance Mount Auburn as habitat for wildlife. We have a thirty-five year-old Neillia sinensis located at the junction of Chestnut and Magnolia Avenues, that is in fine health, and flowers profusely late-May/early-June.